I had this vague memory of a TV variety special the LDS Church produced in the late 1970s called “The Family … and Other Living Things.” I couldn’t remember much about it other than it had the Osmonds and Gary Burghoff. It was talked about a lot in church as a major missionary opportunity. Saints in the United States and Canada will have a great opportunity for missionary work as the Church produces an hour-long television special in November. To be aired in evening “prime time” during National Family Week, which begins November 21, the program is designed to remind everyone of the importance of the family. It is suggested that members invite their nonmember friends into their homes to view the show, which will feature leading Latter-day Saint actors and entertainers as well as some nonmember artists. The program will be professionally produced in Los Angeles and will include Church “commercials” that invite viewers to write in for information on the Church and its belief in the family unit. Nonmembers desiring Latter-day Saints to call at their home to present material on the Church may so indicate when they request a special booklet that is being prepared. The booklet is based on material published in the family home evening manual. Members will be informed about television channels and program times through wards and stakes, along with information on how members can be a part of this important step in Church and television history. This letter was typical of the 90,000 viewer responses received on “The Family … And Other Living Things,” a special one-hour television program produced by the Church and viewed in more than fifty major television markets throughout the United States. The program, the first of its kind offered by the Church, was syndicated through local television stations, many of whom cancelled their regular, prime-time network broadcasting. With a serious underlying message that love, effort, and communication are the basis of better family relations, the program took a tongue-in-cheek approach to everyday family situations. It had its poignant moments, too, and it included three “commercial” messages that illustrated how improvements could be made in the parent-child relationship. Each message invited the viewers to call a special telephone number or to write in to Church headquarters for an eight-page booklet entitled It’s Next Week, which contains an extension of the program’s message. Fifty telephones were installed on the twenty-eighth floor of the Church Office Building in Salt Lake City, where volunteer hostesses accepted requests for the booklet not only during the viewing times of the show, but also for many days after each broadcast. [photo] Some 600 volunteers answered telephone calls and addressed and mailed the requested copies of It’s Next Week to viewers across the country. I was 12 years old when the show was broadcast, and I remember thinking it was extremely cheesy, sort of in the same vein as the Sonny and Cher and Donny and Marie variety shows, but a lot more in earnest and serious. Coming close on the heels of Boyd K. Packer’s landmark talk, “The Arts and the Spirit of the Lord,”, it’s interesting to see what the church saw as “appropriate” art that was consistent with the Spirit and with the mission of the church. I was quite pleased to find a clip from the end of the show on youtube: The Family And Other Living Things (Ending Excerpt, 1978). Obviously, the show is quite dated and cheesy, but if you were alive back then, you know that the production values and content are similar to what was being broadcast on the networks at the time (anyone remember Tony Orlando and Dawn?). It may seem as if I’m picking on the Deseret News, but then I do read the Utah papers every day because I live here. It’s not my fault that the DesNews tends to publish more egregiously bad writing than does the Salt Lake Tribune. So, we start with a riveting headline: “New Utah justice has bond with U.S. justice.” Granted, this isn’t a headline that would attract a lot of attention, but maybe it was meant to indicate a low-key approach to the topic. I’ll let you be the judge of that. Here’s the opening line: “Today, when U.S. Supreme Court Justice Clarence Thomas and Thomas R. Lee face each other with right arms raised, the former will swear in the latter to the Utah Supreme Court.” Fair enough. That is how justices are sworn in, but then we don’t really need to know the mechanics of it (does anyone think they face away from each other, arms flailing?). “In person and on paper, the two men couldn’t be more different.” OK, what the hell is that supposed to mean? The following paragraph explains, and it’s such a thing of beauty it needs to be appreciated one sentence at a time. “A receding gray hairline caps Thomas’ dark brown face.” The contrast of colors is kind of nice, though Askar seems to want to say, “Thomas is black,” without actually saying so. And how can something that is receding “cap” anything? “He is shorter than most men, even though at 62 years old vestiges of a powerful build remain hewn to his frame.” Oh, dear. I’m trying to imagine how a vestige can be anything but old. And how is a build “hewn” to a frame? Hewing refers to chopping or cutting, often to give shape to something. So, he’s telling us that Thomas’s build was chopped to his frame, which makes no sense at all. For that matter, what’s the difference between a build and a frame? I don’t know, but maybe if you hew a frame, you’re left with a build. “His father abandoned him before he turned 2 years old; his lone surviving sibling lives in rural Georgia and soaks up hours of daytime television each and every weekday.” I love the image of someone soaking up soap operas and The Price Is Right “each and every weekday”; if he had written just “each,” I for one wouldn’t have guessed it was also “every weekday.” And one wonders what Thomas’s TV-addict brother does on weekends. Maybe he teaches at a university or plays a local blues bar. But it gets better when Askar describes Lee. “In stark contrast, Lee looks like central casting’s version of a Nordic god: tall, pale, lean and angular.” OK, we get it: Thomas is black, short, and kind of pudgy, whereas Lee is white, tall, and thin (but does he look like a Nordic god to you? For comparison, this is the guy who will be playing Nordic god Thor in an upcoming film). Any “central casting” agent who hired Tom Lee to play a Nordic god would probably get fired in short order. And then we get this: “His father, Rex E. Lee, blazed a trail to the pinnacle of prominence and lawyerly notoriety as the founding dean of BYU’s J. Reuben Clark Law School, solicitor general of the United States during the Reagan administration and the 10th president of BYU.” So much to digest: blazing trails to “the pinnacle of prominence” (lovely alliteration) and “lawyerly notoriety” before we actually hear what his accomplishments were. Then Askar contrasts Thomas’s shiftless brother with Lee’s driven sibling: “Lee’s brother, Mike Lee, can often be found pounding the pavement out on the campaign trail as the heavy favorite to be Utah’s next U.S. senator.” So many hackneyed phrases: “pounding the pavement,” “out on the campaign trail,” “heavy favorite.” But Mike Lee is only campaigning “often.” I wonder what he does with his spare time? Maybe he watches The View with Justice Thomas’s brother. “And yet, despite all their differences, Justice Thomas and soon-to-be Justice Lee share such a close bond that they’re practically family.” Ah, there’s the bond part, and it’s even “close.” And who would have imagined that too such different guys (the short but vestigially powerful “dark brown” man and the “pale” Nordic god) would be so close? “The story of Thomas and Lee began back in 1993.” This sentence amounts to, “In 1993,” but our author is clearly not interested in introductory clauses unless they carry the rhetorical weight of “In start contrast” or “And yet, despite their differences” (a twofer, as it were). I’ll spare you Lee’s report of the interview, but it’s in keeping with the tone of the article. Suffice it to say that from that one hour, he felt drawn to Thomas (whom he describes as “warm, generous, kind, fun-loving, [and] wonderful. … (My) desire (and) longing to clerk for him was [sic] magnified tenfold”). But back to the author. That last sentence is a doozy. The long introductory clause is followed by “Thomas had recently moved into the former chambers of White,” which seems to loop back awkwardly to make sure we know it’s White’s chambers we’re talking about (as opposed to, say, the chamber of secrets or the Orem Chamber of Commerce). Then we are told–after a superfluous dash–that Lee’s father had clerked for White in the sixties; we need to be told this was a “Supreme Court” clerkship so that we don’t assume Rex Lee was doing a 7-11 clerkship for Justice White. “During their year together at the Supreme Court, Thomas educated Lee and his three fellow clerks about how to be effective jurists.” Yep, that’s part of being a clerk. Next: “Thomas also steeped them in the sagacious nuggets of wisdom he had gleaned from his grandfather, Myers Anderson, and which would eventually be a basis for Thomas’ 2007 memoir, ‘My Grandfather’s Son. '” Dear God, make it stop. How in the hell do you steep someone in nuggets, let alone sagacious ones? And since when does someone glean nuggets? And am I the only one who noticed that the author uses the possessive apostrophe without a following ‘s,’ a style choice usually reserved only for Jesus? Maybe he’s subtly expressing what he thinks of Justice Thomas. But all that aside, I don’t know why we’re being told that Thomas shared his wisdom with his clerks, which he “gleaned” from his grandfather and then wrote down in a book. It almost sounds as if Thomas was using his clerks as a preview audience for his book. “The relationship between Thomas and Lee inexorably changed in 1996 when Lee’s father passed away following a prolonged bout with cancer.” ‘Inexorably’ is clearly the wrong word here, as it means ‘relentlessly,’ not permanently or drastically, as the author appears to mean. And why reduce Rex Lee’s courageous and excruciatingly long illness to a “bout,” as if he had just been fighting off a cold? “At that point, Thomas began filling a more active mentoring role for his one-time clerk.” Now we get two paragraphs from Lee explaining how Justice Thomas has become a close friend, confidant, and adviser. Then the money question: “So what was Thomas’ advice last year about the idea that comes to fruition today as Lee joins the Utah Supreme Court?” Ouch. He inserts “last year” so that we know that the “idea” in question is Lee’s “career decision” to try to get the Supreme Court nomination, which Lee discussed two paragraphs earlier. But even though we haven’t talked about an idea, it’s coming to fruition. After a recitation of some generic platitudes from Lee (“‘He felt that this was something that would be very enriching to me professionally and fulfilling and enjoyable,’ Lee said”), we’re left pondering the little dark brown man steeping a Nordic god in sagacious nuggets of wisdom until an idea comes to fruition. Somehow, watching daytime television each and every day doesn’t sound half bad. Beats reading the Deseret News. A new body of research out of the University of Michigan suggests that’s not what happens, that we base our opinions on beliefs and when presented with contradictory facts, we adhere to our original belief even more strongly. which corrections actually increase misperceptions among the group in question. Recent work has shown that most citizens appear to lack factual knowledge about political matters (see, e.g., Delli Carpini and Keeter 1996) and that this deficit affects the issue opinions that they express (Althaus 1998, Kuklinski et al. 2000, Gilens 2001). Some scholars respond that citizens can successfully use heuristics, or information shortcuts, as a substitute for detailed factual information in some circumstances (Popkin 1991; Sniderman, Brody and Tetlock 1991, Lupia 1994; Lupia and McCubbins 1998). People typically receive corrective information within “objective” news reports pitting two sides of an argument against each other, which is significantly more ambiguous than receiving a correct answer from an omniscient source. In such cases, citizens are likely to resist or reject arguments and evidence contradicting their opinions – a view that is consistent with a wide array of research (e.g. Lord, Ross, and Lepper 1979; Edwards and Smith 1996; Redlawsk 2002; Taber and Lodge 2006). Political beliefs about controversial factual questions in politics are often closely linked with one’s ideological preferences or partisan beliefs. As such, we expect that the reactions we observe to corrective information will be influenced by those preferences. In particular, we draw on an extensive literature in psychology that shows humans are goaldirected information processors who tend to evaluate information with a directional bias toward reinforcing their pre-existing views (for reviews, see Kunda 1990 and Molden and Higgins 2005). We follow Lodge and Taber (2000) and Redlawsk (2002) in interpreting backfire effects as a possible result of the process by which people counterargue preference-incongruent information and bolster their preexisting views. If people counterargue unwelcome information vigorously enough, they may end up with “more attitudinally congruent information in mind than before the debate” (Lodge and Taber 2000: 209), which in turn leads them to report opinions that are more extreme than they otherwise would have had. And what’s interesting is in some of these cases, it’s the people who are most sophisticated who are best able to defend their beliefs and keep coming up with more elaborate reasons why 9/11 was really a conspiracy or how the weapons of mass destruction were actually smuggled to Syria or whatever the case may be. So this isn’t a question of education, necessarily, or sophistication. It’s really about, it’s really about preserving that belief that we initially held. All of this means that it’s extremely difficult to reconsider one’s cherished beliefs, even in the face of contradictory facts. I’m of the opinion that a shift in paradigm–to borrow from Thomas Kuhn–only comes when the facts overwhelm one’s beliefs. Last week I watched a documentary about the Berlin Wall, and they mentioned the role of the Nicolaikirche in Leipzig in holding Monday prayer meetings that spread resistance to the East German regime peacefully and ultimately led to the fall of the government and the wall. According to the church’s website, “From 8 May 1989, the driveways to the church were blocked by the police.” But the crowds of people could not be stopped. Even “a hideous show of force by soldiers, industrial militia, police and plain-clothes officers” on October 7 failed. “On this day, for 10 long hours, uniformed police battered defenceless people who made no attempt to fight back and took them away in trucks. Hundreds of them were locked up in stables in Markkleeberg. In due course, an article was published in the press saying that it was high time to put an end to what they called ‘counter-revolution, if necessary by armed forces. '” A month later, the wall came down, and the miserable dictator who had built it, Erich Honecker, was relegated to the dustbin of history. The black darkness of night had ended. The bright light of day had dawned. The gospel of Jesus Christ would now be carried to the millions of people in that nation. Their questions concerning the Church will be answered, and the Kingdom of God will go forth. As I reflect on these events, my thoughts turn to the Master’s words, “In nothing doth man offend God, or against none is his wrath kindled, save those who confess not his hand in all things.” (D&C 59:21.) I confess the hand of God in the miraculous events pertaining to the Church in the German Democratic Republic. I understand that the church believes in obeying the law, but where was the church when it was time to fight for freedom? It was giving gifts to Chairman Honecker and begging for missionaries. It’s well known that the church had a rather cozy relationship with the Pinochet dictatorship in Chile, but it is a little surprising that they sucked up to the East Germans. And it’s highly ironic that they did so just before such a momentous triumph of freedom. The church seems more interested in gaining access to potential converts than anything else, which is a pragmatic and understandable position. They couldn’t have known that within six months they would have had all the access they wanted without having to be friendly with Honecker and his cronies. It’s not like they had a special line of communication with a God who could have told them just to sit tight and stand on righteous principles for another six months. 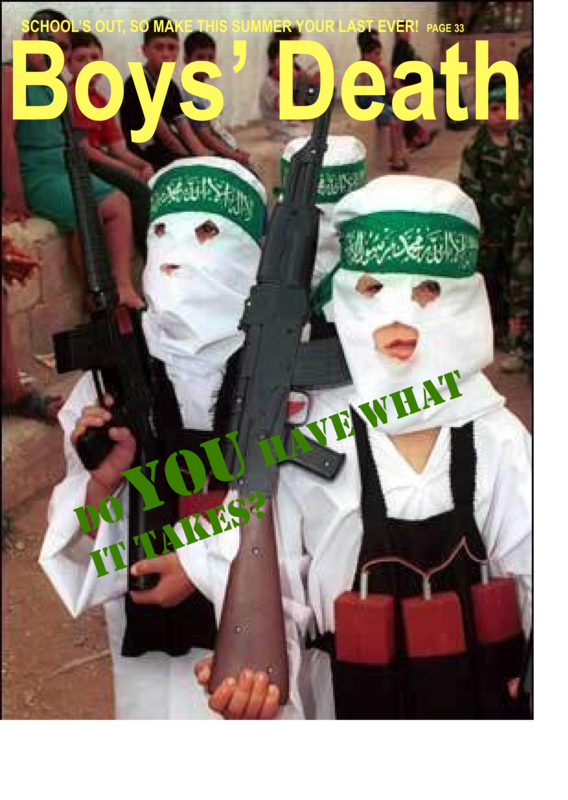 Flush from the success of launching its new magazine, “Inspire,” Al-Qaeda is rushing ahead with a series of new magazines designed to appeal to different demographics. I was lucky enough to receive an advance copy of some of the new titles. 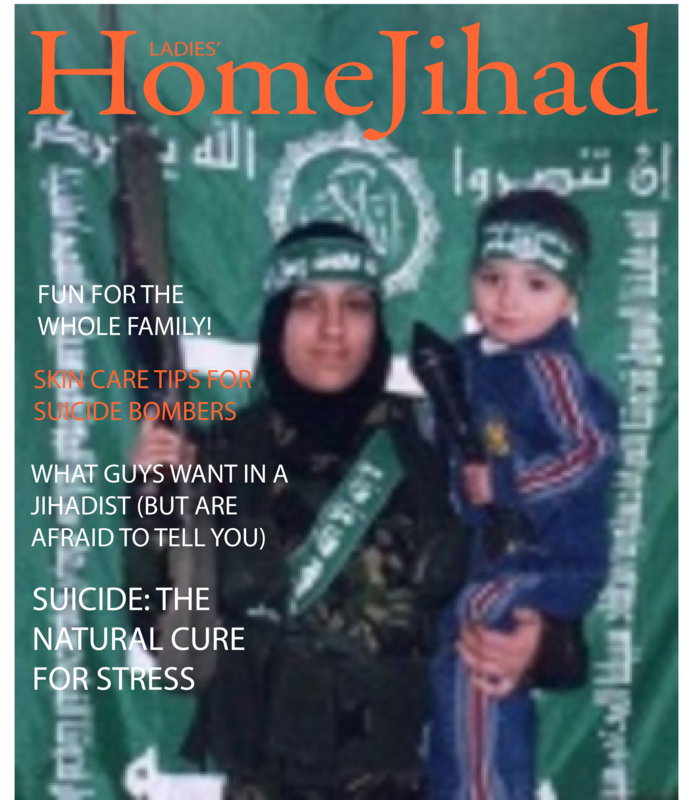 This one is loaded (no pun intended) with helpful tips for today’s busy homemaker and jihadist. Learn how to keep your man happy while still finding time to be a mom and a roadside bombmaker. 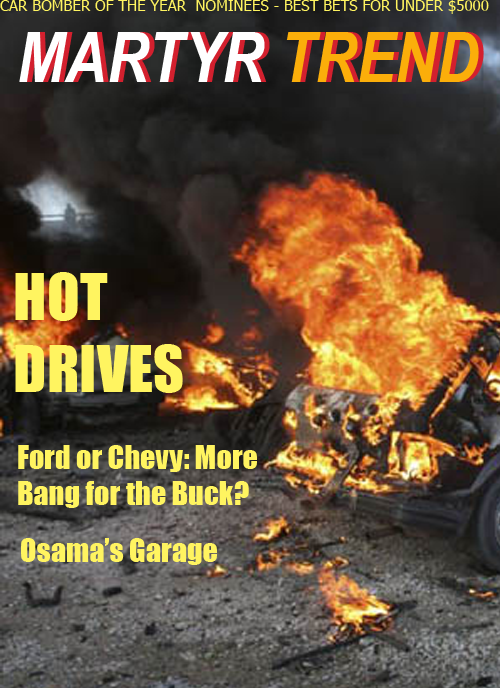 See the latest jihadist fashions, recipes, and fitness programs. What man doesn’t like cars and explosions? This photo-packed glossy features the latest in automotive hardware from Detroit and around the world. Let’s not leave out the kids! Boys everywhere will love this one, which is chock full of ideas for summer recreation: hiking, camping, shooting, you name it. My personal favorite, O shows the softer side of Osama bin Laden. Sharing his love of good books (Nicholas Sparks is a favorite), fine dining, and weapons of mass destruction, Osama shows why he is one of today’s most popular speakers and entrepreneurs. You are currently browsing the Runtu's Rincón blog archives for July, 2010.